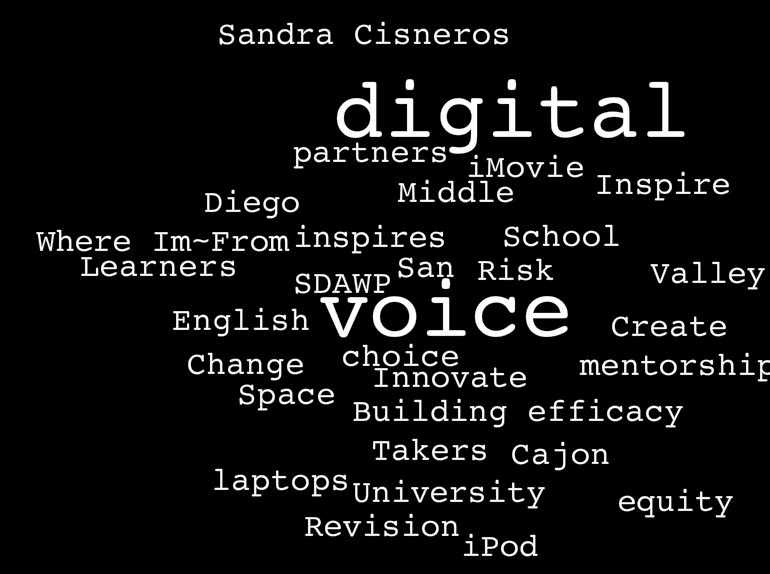 The San Diego Writing Project has had a focus for the past few years on digital literacy. An over arching question has been “How do we motivate teachers to go from consumers of media, to producers of media?” We recognize that the reality for many teachers is that we have 21st century goals with classrooms equipped with 20th century resources. The reality was that many of our teacher consultants viewed themselves with low self-efficacy, were facing time constraints both in our classroom and for staff development. Most importantly, we discovered there were few mentors out there doing the types of things we wanted to explore; so we began to look within. We realized that if we were to commit to move on a digital continuum, we needed to become the mentors we need. The first step was to develop a common reference point from which to work. The idea that each student and teacher is somewhere on a digital learning continuum, from a basic understanding of what is available to becoming an advocate for teachers and students to have access to the digital media and support in their communities. Another understanding was teachers and students enter the continuum from various places at different times, it is not a linear process, but an ongoing one. From this work, SDAWP co-director Christine Kane and SDAWP fellow Janet Ilko forged a new project. What would happen if students from a college graduate class and an urban middle school developed a digital space to mentor each other? What did it mean to mentor? What did these two groups of students have to teach each other? Teachers and students alike learned many things from this project. My own development in digital literacy mirrors this continuum. On many levels I still do not see myself as a teacher who is comfortable in the digital world. I came into digital literacy with the idea that it would encourage my students to write more and for a wider audience. I began as a consumer, using the web as an on line encyclopedia of sorts, going out for information but not contributing information of my own. As I grew more comfortable, I began to produce media, first on our school site blog, then my own personal blog to learn how to use this space in different ways. I relied on mentors, those who knew more than I, to guide my exploration. Then three years ago, I was selected to be part of a pilot program to bring one-to-one iPods into our classroom. This was that leap of faith that fundamentally changed the structure of my classroom. With every new project we learned side by side, taking turns leading. I was no longer the keeper of the information, I became more facilitator than expert. I knew that writing would be the focus, and this new tool would bring a new excitement to the work. i had the knowledge of language and writing, but my students had the savvy and experience with this particular tech tool. We became partners in these projects, along with other digital mentors that guided our work. It has been this process that has changed my definition of mentor, and my view of digital literacy. I learned quickly that mentors come in all shapes and sizes, and frankly, many of my tech mentors became the students themselves. Flashforward to our most recent work at the San Diego Area Writing Project. Christine Kane, the co-director of our project, is also a professor at the University of San Diego. This past fall she taught a course on Multiple Literacies for graduate students in the School of Education. I had expressed an interest in coming to her class and share some of the work we were doing in digital writing. We wanted this to be more than just an observation and evaluation of my student work and instructional pedagogy, we wanted her students to experience the writing process on their own terms using similar prompts, time constraints and opportunities. What evolved was inspiring to students on both sides of the project.